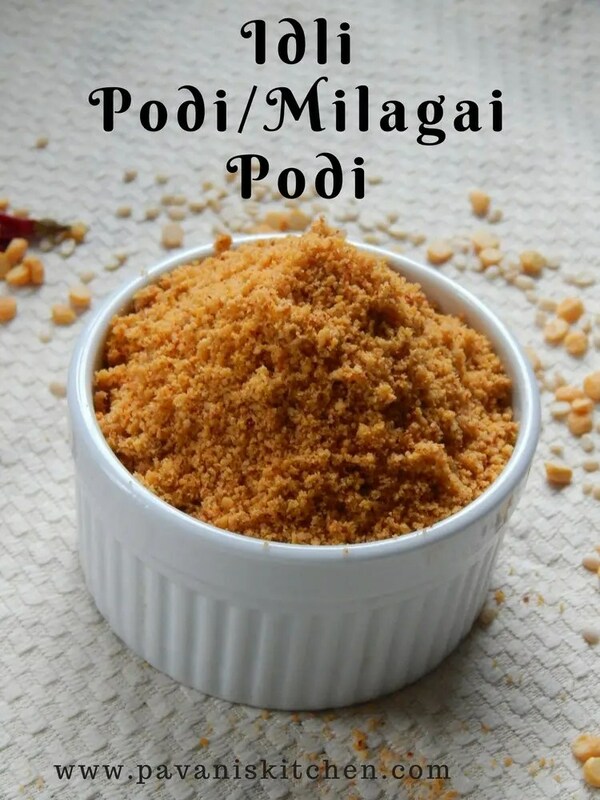 Idli podi/Milagai podi is a common podi for most of the south Indians for having breakfast with idli or dosa.This is a very easy recipe, there are so many varieties of idli podi’s, but this is the most popular among all because it is very tasty and all the lentils are roasted and ground. 1.Heat 1 tsp of oil in a pan, add urad dal and roast in low flame until it changes into golden colour. Then transfer to a plate to cool down. 2.In the same pan add channa dal and roast the lentil until it changes its colour.Transfer to a plate to cool down. 3.Add a tsp of oil in the same pan and roast sesame seeds on low flame till they change colour into golden.Transfer to a plate to cool down. 4.Dry roast red chillies along with curry leaves for 2-3 min and transfer to a plate to cool down. 5.Add all the cooled ingredients into a mixer along with salt and asafoetida and grind into coarse powder or you can grind into a fine powder according to you. 6.Transfer to an airtight container and can be stored up to 1-2 months. 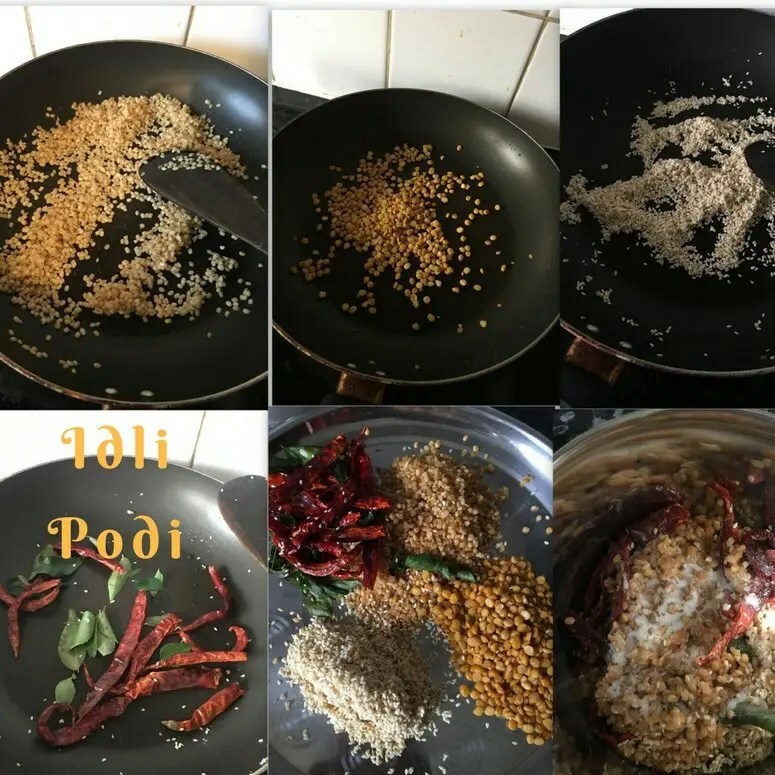 Idli podi/Milagai podi is a common podi for most of the south Indians for having breakfast with idli or dosa.This is a very easy recipe, there are so many varieties of idli podi ’s, but this is the most popular among all because it is very tasty and all the lentils are roasted and ground. Heat 1 tsp of oil in a pan, add urad dal and roast in low flame until it changes into golden colour. Then transfer to a plate to cool down. In the same pan add channa dal and roast the lentil until it changes its colour.Transfer to a plate to cool down. Add a tsp of oil in the same pan and roast sesame seeds on low flame till they change colour into golden.Transfer to a plate to cool down. Dry roast red chillies along with curry leaves for 2-3 min and transfer to a plate to cool down. Add all the cooled ingredients into a mixer along with salt and asafoetida and grind into coarse powder or you can grind into a fine powder according to you. Transfer to an airtight container and can be stored up to 1-2 months. 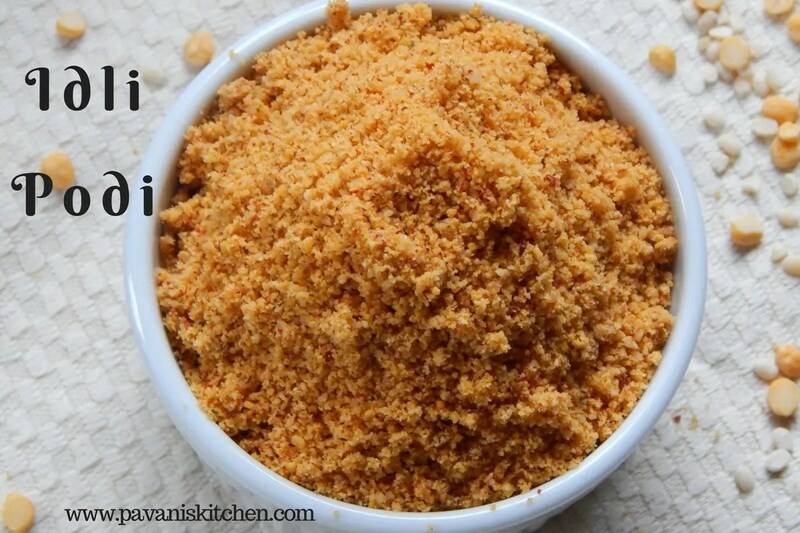 Enjoy this tasty and delicious Idli podi/Milagai podi !